Anyone who hasn't yet heard of Gangstagrass, I say to thee - you must be CRAY-ZEE! I came to learn about them back when I fell into my "Justified" coma and couldn't get off of my couch for the entire first season wondering what the heck the show had in store next for the bunch of fun lovin' crazies Raylan Givens and Boyd Crowder, and MAN! That theme tune was stuck in my head so bad I [of course] had to hear all the available music associate with Gangstagrass ASAP to see if they were a one hit wonder or if they were for the long haul - and folks! It is THE LONG HAUL! 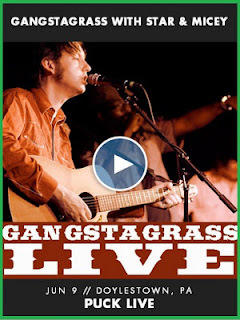 Gangstagrass can be described as: An unlikely marriage of bluegrass and rap! Magically intertwined into the kind of sound that successfully "knocks your socks off", while blasting a constant beam of sunshine straight to your soul! Suffice to say, there isn't much that sounds quite like the banging tunes they have to offer - and better still, they're coming to an area near YOU pretty soon! Unless they're not, in which case, that's a REAL shame, but THEY ARE - especially if you're in the DOYLESTOWN, PA area on SUNDAY 9th June - THIS SUNDAY - at Puck Live, with Star & Micey!! There is a $12 cover charge at this venue, in advance, or $15 at the door - you can't beat that for entertainment! BOOM! Amidst tour dates spread across the country - from INDIANAPOLIS, IN. at the White Rabbit Cabaret (TONIGHT!) to the Square Roots Festival in Chicago, IL. on Sat 13th of July - and more in between, you have a fabulous chance of catching them in a town/city/suburb/back alley near you SOON!! For a full list of upcoming tour dates, venues and prices, you can hop on over and take a look-see HERE - and if you haven't yet heard a word i've said (or a tune they've put together) then you, my friends, need to head on over HERE now and get in on some of the action at their website! There is no way on earth this music won't get you out of your seats and moving! I dare you! And HEY!! Why not go follow them on Twitter and keep up to date RIGHT HERE!!! What are you waiting for!? Head on over and listen to them now! Then hop up to a live venue near you soon! No way! They are coming to my town tomorrow and at this little bar, how awesome is that! I am so excited, now I just have to find a sitter! So cool, thank you so much! OH wow, I had never heard bluegrass rap before. I do love me some Rockabilly tho. This is awesome tho.